As part of the $484.2 million redevelopment, the new south block will have a 30-bed gerontology unit and 30-bed maternity unit. These units will free up wards in the hospital's north block for more services, including paediatric oncology. The new paediatric oncology day unit will provide an expanded service for local children with cancer and will include three new chemotherapy chairs. For many children, this will mean no longer having to travel to Brisbane for treatment. The $67.5 million expansion to the Townsville Cancer Centre will include 26 additional chemotherapy chairs and two new linear accelerators used in radiation treatment of cancer patients. The Townsville Hospital's pathology expansion is designed to deliver a streamlined facility providing world-class diagnostic services. Leading-edge technology in Telehealth equipment and a certified PC3 (physical containment level 3) laboratory enables the lab to handle highly infectious organisms. A refurbishment of mental health facilities will enable the hospital to provide a new model of care with a focus on rehabilitation for mental health consumers. An Antimicrobial stewardship program will improve patient safety and reduce infection rates. 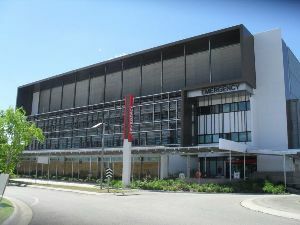 The Townsville Hospital (TTH) is a tertiary referral hospital located in the suburb of Douglas, Townsville. The hospital treats patients from across North Queensland, as far north as Cape York Peninsula and the Torres Strait Islands, and west to Mount Isa and the Gulf of Carpentaria. It is also the major teaching hospital for James Cook University's schools of medicine, nursing and allied health and for the Barrier Reef Institute of TAFE. The Townsville Hospital provides the very latest in cardiac, obstetric, gynaecological, paediatric, neurosurgical, orthopaedic, cancer, mental health, neonatal, allied health, anaesthetic and intensive care services to the community.